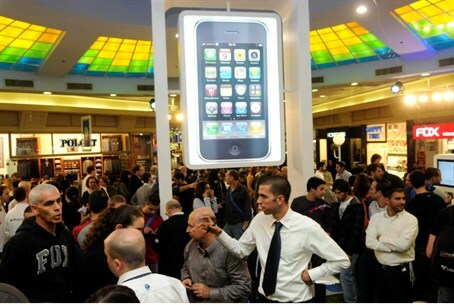 Sunday marked the first day that the iPhones went on sale in Israel. A total of over 6,000 iPhone 5S phones were sold, while 1,500 iPhone 5C phones were purchased by Israelis. The phones were sold through a variety of outlets, including the retail stores of the cellphone service providers, the internet, and the iDigital stores (the licensed Apple representatives in Israel). The price for the iPhone 5S in Israel NIS 3,649 ($1,039), while the 5C is NIS 3049 ($869), unlocked, meaning that they can be used with any Israeli service provider. Israeli sales matched the pattern of sales elsewhere, said Apple Israel officials; one iPhone 5C is sold for every four 5S models. iDigital is offering owners of the iPhone 4S and 4 a trade-in upgrade program. For the first time, Apple introduced two new iPhone models simultaneously, one – the 5S – to appeal to those who wanted a top of the line, cutting edge device, and another aimed at budget buyers. The 5S has a superior processor and a better camera. The 5S also features a metal case, available in three colors – gold, silver, and gray – while the 5C, with a plastic case, is available in green, blue, yellow, pink, and white. Cellphone companies refused to disclose exactly how many devices they had sold, but Orange, Pelephone, and Cellcom all said that they had sold “thousands” of devices. Industry officials said that Apple has forbidden iPhone sellers from disclosing how many devices they sell, but that information will be included in the quarterly reports of all three companies, which are public companies. As such, it was impossible to know who was buying which device, but if the pattern in Israel is similar to that of other places, the gold iPhone 5S is likely to be preferred by men, while women are likely to choose the pink iPhone 5C, Apple Israel officials said.